Ya Jagoff!!! | Big News for This Sunday! Home Uncategorized Big News for This Sunday! Hey… this Sunday, February 19th, come to the YaJagoff Podcast recording and meet Pens Alumni Tyler Kennedy and his wife, Brandi Kennedy, 105.9X’s “Super Genius” Mark Madden and the Polka Palastros! 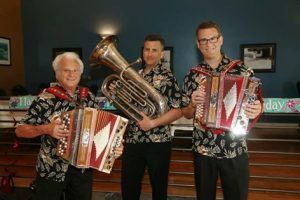 Yes… I live polka trio! No wonder Tyler and his wife wanted to come on our show. 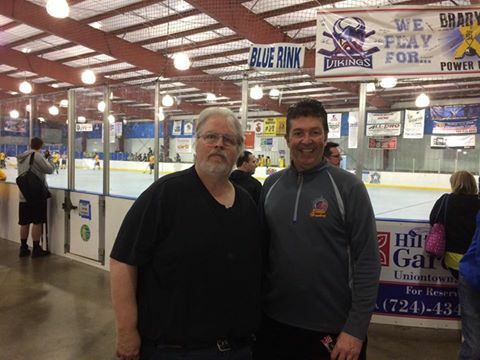 Coach Mike Albright (in photo with Mark Madden) and his peeps from Team Pittsburgh Youth DEK Hockey, the PREMIER DEK Hockey facility in Pittsburgh, are welcoming us to an open day of hockey and polka/hockey frolicking while we podcast! We will record the podcast from 11:30am-12:30pm. In the meantime, the Team Pittsburgh Coaches and families will be happy to show your kids, grand kids, neighbor kids and adults that act like kids around the INCREDIBLE Team Pittsburgh DEK Hockey facility. On top of that….we will be making a huuuuuuuuuuuuuuuuuuuuuuge announcement about our new affiliation with Total Sports Enterprises. 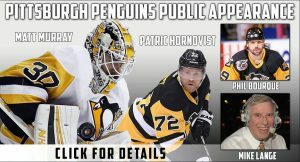 FYI.. we are going to have a chance for someone to win 2 tickets to their Thursday evening signing with Pens Matt Murray, Patric Hornqvist, Jake Guentzel and broadcast team Phil Bourque and Mike Lange! So come with us… this Sunday… Ya Jagoffs!